By now, you’ve heard the sad, sad, unbelievably sad news. I would have written sooner but it’s taken me a few days to get up the strength to reach the machine. Talk about a punch to the midsection. I must clarify that I’m not any more connected to the behind-the-scenes decision making process than you are. But even just based on the news that has been shared publicly, I certainly can’t blame the powers that be for making this call. Carleton College opened River City Books as a service and benefit to the community. The economic climate — generally and especially within the book trade — is much different today than it was in 2002, as many larger, more established bookstores in many cities across the country have fallen in recent years. RCB was not intended as a money-making venture; it was about helping downtown, which sorely needed a bookstore, and the college went above and beyond to create and sustain a fine store that provided, among other things, quality culture and good jobs. In fact, despite the decision, the mission’s intent still makes me appreciative. Even if the news still hurts! A day or so before I got word, I received my copy of the Jan. 5 New Yorker. I can’t believe that cover. Of all weeks! That’s a bit how I feel. RCB has been not just a source of income but more than that it’s been, at least for me, a connection to community. I’ll always have many fond memories of time spent there, talking to people about books (is there anything better?) … Hey, before I get teary, before I take a long walk down Memory Lane, I’ll cut myself off and just say that I’m going keep pounding these letters until they take the keyboard away. So I’ll have time to reflect in the coming weeks and months. In the meantime, the sale ends Jan. 9. Still many great deals to be had! I don’t know about you, but 2008 was a rough year. Seemed like every time I picked up the newspaper there was more bad news and I know every time I picked up my retirement account statements there was. But, thank goodness, we’re putting this one to bed right quick. Before I ring it in, I thought I would phone it in. Er, um, I mean, send this important note about River City Books’ New Year’s hours. They’ll be there till 6 p.m. tonight (closing two hours early; can hardly blame them) and will be shut down all of the first day of 2009. Note, though, that at 10 a.m. on Friday the big sale resumes! I hope you have a happy and safe celebration. Saturday, Dec. 20 — 8 a.m. to 6 p.m.
Sunday, Dec. 21 — 10 a.m. to 6 p.m.
Monday, Dec. 22 — 9 a.m. to 9 p.m.
Tuesday, Dec. 23 — 9 a.m. to 9 p.m.
Wednesday, Dec. 24 — 9 a.m. to 4 p.m.
Friday, Dec. 26 — 9 a.m. to 8 p.m.
Saturday, Dec. 27 — 10 a.m. to 5 p.m.
Sunday, Dec. 28 — 11 a.m. to 5 p.m.
Monday-Tuesday, Dec. 29-30 — 10 a.m. to 8 p.m.
Wednesday, Dec. 31 — 10 a.m. to 6 p.m. This year I am thankful for all the good books I have read, all of the good food I have eaten, and all of the money I will save from this day forward. What in a turkey’s name am I talking about? Let me explain: Yesterday I stopped by River City Books and picked up one of their new handy and sturdy shopping bags. While making this purchase I also bundled up as many books as I could fit into that bag and at the register the kindly bookseller took 10 percent off my entire bill! What’s more, every time I bring my bag back to the store they are going to take an extra five percent off the tally. This is five percent, mind you, on top of any sales or bargains they are already offering. Meaning, the 15 percent discount I usually get for buying my book club’s book at RCB suddenly becomes a 20 percent discount. So I always save. I also feel good because when I tote my bag (they have two snazzy styles to choose from; click the pic to enlarge) I stop consuming all those unneeded plastic bags that are jammed into my cupboard as though I might suddenly need 26 of them at a moment’s notice. So this is the ultimate win-win. I save money, I reduce clutter, and I help the environment. Now you know why I am thankful. I was down at the old neighborhood bookstore last night and I saw something that really got me goosed, er, um, jazzed (I’m nothing if not sensitive about bird biased language). 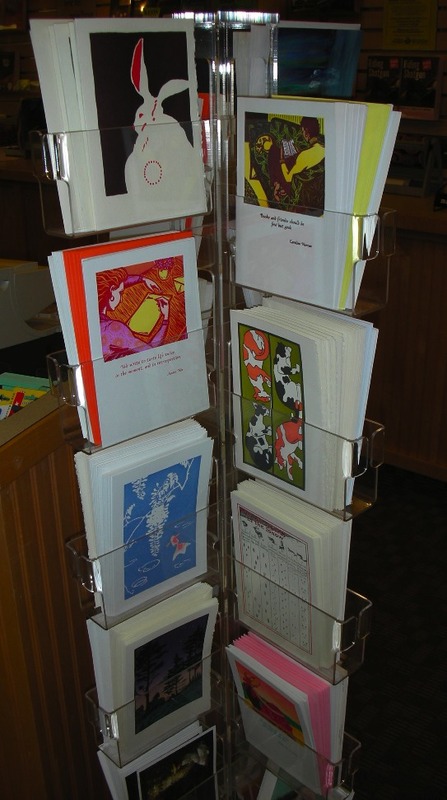 River City Books now has a bigger-better selection of greeting cards. There are Christmas, Chanukah, birthday, anniversary, blanks (I like the blanks! ), and on down the line. There are two racks full near the register and another display at the entrance. River City has carried greeting cards in the past, but nothing as snazzy as these new ones. There are some really high quality cards in the mix, cards that have been hand silk-screened or hand letter pressed. And none too soon, either. With the holidays on the horizon I am especially grateful because though I would just as soon skip the card part of gift-giving Mrs. Raven will not allow us to give a gift sans a card. This means I would have to make another stop and, frankly, I am much too lazy to do that. Now I can pick up a book — or a gift certificate; nothing wrong with those! — and a card and be done with it. I mean, and have a nice, presentable gift for someone I care deeply about. Seriously, next time you’re there, check these babies out. My picture doesn’t do ‘em justice. What will be the biggest movie this holiday season? Frankly, and this won’t surprise regular readers, I don’t have a clue. 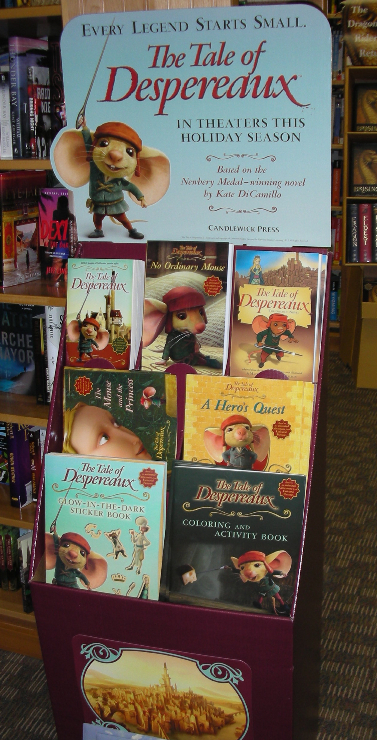 But I do know thousands of young eyes are anxiously waiting for the Tale of Despereaux, which will be release in theaters this December. “Tale,” of course, is based on the book of the same name by Newbery Award-winning Minnesota (and former Northfield Reads!) author Kate DiCamillo. If you haven’t already read the book, now’s the time. After all, you gotta read the book before you see the movie. Note, too, that when you stop by River City Books to pick up your paperback copy, you might want to check out this display (see picture). Not only does the store have the young adult novel, RCB also has activity books, sticker books, coloring books and more all with movie tie-ins. Heck, you just might be able to get a holiday gift checked off your list already! The holidays — hey, Halloween counts; don’t say it doesn’t — remind me that River City Books is once again the greatest source of calendars in the known universe. OK, at least among stores located in the 50057 area code. RCB has always been the place I pick up a calendar this time of year but, really, they’ve outdone themselves this year. Never seen a bigger-better selection of calendars. You like puppies? They got puppies. A math guy or gal? They have something for you. Oh, you’re one of those people who likes to look at beautiful landscapes? They got those, too. The accompanying photo is one display among several and judging by the looks of things, they are adding to the stash almost every day. Gotta seem ‘em to believe ‘em. The Raven Is Dead! Long Live The Raven!